Preheat oven to 400º F, unless you have a microwave. In a bowl, combine the chicken, half the scallions, and 1/2 cup of the enchilada sauce. Soften the corn tortillas, two at a time, by steaming them for 10 seconds, or cook in a microwave for 10 second on high. Spoon 1 cup of the enchilada sauce on the bottom of a 9×11-inch pan. Fill each tortilla with about 1/4 cup of the chicken mixture. Roll each tortilla and place seam side down on the sauce in the pan. 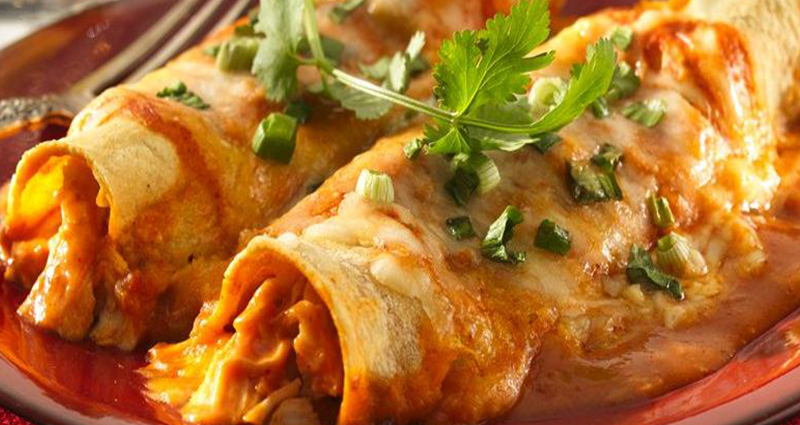 Top with the remaining cup of enchilada sauce, sprinkle with the cheese and the remaining scallions. Bake for 10 minutes or microwave on high for 5 minutes.